Born: October 1867, London, United Kingdom. Died: 10 May 1952, Harare, Zimbabwe. Joseph A. O'Neil entered his father's business after completing his schooling, but later joined the Society of Jesus (Jesuits). At the age of 25, suffering from respiratory problems, he was advised to leave Britain for health reasons and came to the Cape Colony. He held an appointment in Grahamstown for some time, but as a result of further health problems moved to Vleeschfontein Mission, near Mochudi in Botswana. From there he went to Graaff-Reinet, but by 1896 had settled at Dunbrody, along the Sundays River in the Uitenhage district, where he remained for ten years. 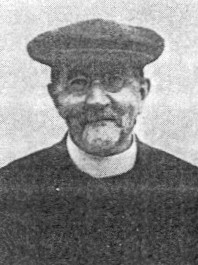 Despite continuing health problems he took up theological studies and was ordained priest in 1898. In 1905 he moved to Empandeni Mission in Matabeleland (near Plumtree, Zimbabwe) and from there to Embakwe. In 1914 he became Chaplain at Emerald Hill in Salisbury (now Harare), where he remained until 1937. O'Neil was actively involved in studying and collecting insects from the time of his arrival in the Cape Colony in 1892. His sharp intellect, powers of observation and good memory enabled him to build up valuable collections which enriched several southern African museums. In 1892, the year of his arrival, he presented a collection of rare beetles from Grahamstown to the Albany Museum. Further donations followed in 1897-1898 and 1900-1906, when he presented mainly Coleoptera, Hymenoptera and (in 1904) Mutillidae (Velvet ants). During 1912 and 1913 he made further donations from Zimbabwe, including many butterflies. In 1902, 1904 and 1912 he identified many of the museum's beetles, and even filled up gaps from his own collection. The new species of Hymenoptera that he collected, mostly at Dunbrody, were described by P. Cameron* in three contributions to Volume 1 of the Records of the Albany Museum (1903-1906). During these years O'Neil presented insects also to the South African Museum in Cape Town, for example, Coleoptera from Grahamstown (1893) and the Uitenhage district (1896, 1897); 136 species of Coleoptera and Hymenoptera (1898) of which 54 species were new to the museum's collections, including some minute species described by A. Raffray* (1898); insects belonging to several orders and other land invertebrates collected at Dunbrody (1899-1905), including many species new to the museum; a collection of arachnids from Dunbrody (1902); various insects from Zimbabwe (1907); and ants from Zimbabwe (1914). The new species of plant-eating beetles collected by him in the Cape Colony, with those collected by G.A.K. Marshall* in Mashonaland, were described by M. Jacoby in the Proceedings of the Zoological Society of London in 1900. In recognition of his valuable contributions he was named as one of only nine "correspondents" of the museum in 1899, which meant that he received its publications free of charge. O'Neil was a true pioneer in southern African entomology, particularly in the study of Lepidoptera and Coleoptera. Shortly after moving to Harare he published five entomological papers, which included descriptions of some new species: "The Emperor moths of Southern Rhodesia" (1917) and "The Hawkmoths of Mashonaland" (1918) in the Rhodesia Agricultural Journal; "The Acraeas of Southern Rhodesia" in the Proceedings of the Rhodesia Scientific Association (1918-1919); "Notes on some Rhodesian moths of the family Saturniidae" in the Annals of the Durban Museum (1919); and "The Carabidae of Salisbury, Mashonaland" in the South African Journal of Natural History (1920). He also prepared an illustrated manuscript on butterflies, but this was not published. Many of his beetles, particularly his Chrysomelidae (Leaf beetles), are in the National Museum, Bulawayo. A collection of his Lepidoptera, mainly butterflies, is housed in St George's College, Harare. Several insect taxa were named in his honour, for example the wasp genus Oneilella (by P. Cameron in 1903-1906) and the moth genus Oneiliana (1932). O'Neil became a foundation member of the South African Biological Society in 1916/7. By 1919 he had been elected a Fellow of the (British)Entomological Society. He became a member of the Rhodesia Scientific Association in 1920 and was still a member in 1931. His interests included philately, and the study of indigenous languages. During his early years in Zimbabwe he wrote A phrase book in English and Sindebele, with a full vocabulary and a list of wild animals, birds and reptiles (Bulawayo, 1909), followed by A grammar of the Sindebele dialect of Zulu (1913). A paper by him on the natives of south-west Matabeleland and some of their religious customs was published in the Proceedings of the Rhodesia Scientific Association in 1921. Years later, in 1935, he published a Shona grammar. Despite suffering severe ill-health during his entire adult life he became 85 years old and was always cheerful and sympathetic towards others. Annals of the Durban Museum, 1917-1920, Vol. 2. Cape of Good Hope. Report of the committee of the Albany Museum (title varies), 1892, 1894, 1897, 1898, 1900-1906, 1912, 1913. Cape of Good Hope. Report ot the trustees of the South African Museum, 1893, 1896-1905, 1907. Pinhey, E.C.G. Rhodesian lepidopterists: Joseph O'Neil (1867-1952). The Rhodesian Science News, January 1979, Vol. 13(1), p. 13. Records of the Albany Museum, 1903-1906, Vol. 1. Rhodesia Scientific Association. Proceedings, 1930-1931, Vol. 30, pp. 53-61: List of Proceedings... [1899-1930] and list of members. South African Journal of Natural History, 1918, Vol. 1(1), pp. 8-15: Roll of Foundation Members [of the SA Biological Society]; 1920, Vol. 2: Paper by O'Neil. Zimbabwe, Death notices, 1904-1976. FamilySearch https://familysearch.org/ark:/61903/1:1:QVBQ-C6TT accessed 31 December 2015.